“Sorry, Must Dash. I Left My Riding Crop At The Mortuary.” | What I think About When I Think About Writing. Sunday night isn’t usually the best night of the week to stay in and watch TV, unless that is you like reality shows, programmes devoted to the countryside and finding out how much your granny’s snuffbox is really worth. Since 24 went off air, nothing else has taken its place – well, nothing that was worth troubling my DVR for. Then Sherlock came along. Not another Holmes, I hear you say. He is so last year. Well, he’s not. He’s not even Victorian anymore. Sherlock Holmes is in the here and now. He is in London in the year 2010. WTF? I hear the purists among you cry. Sacrilege! Blasphemy! Crikey! Or words to that effect. Calm down, people. Let’s look at this rationally. Let me tell you who’s in charge. It’s Stephen Moffat, the executive producer and show-runner of Doctor Who. By his side is his own Dr. Watson: Mark Gatiss, himself a writer on Doctor Who and co-creator of The League of Gentlemen (the British satirical comedy show, not the classic graphic novel – and certainly not the crass movie based on it). These men have what it takes to come up with the goods. And by the goods I mean intelligent writing, cleverly constructed characters, ingenious set-pieces, and the cojones to play around with conventions and well-loved literary creations. All the necessary requirements for a Sherlock Holmes story are present and correct. There is a mystery to be solved, one that stumps the police. And they have no choice but to call on a consultant: Sherlock Holmes. 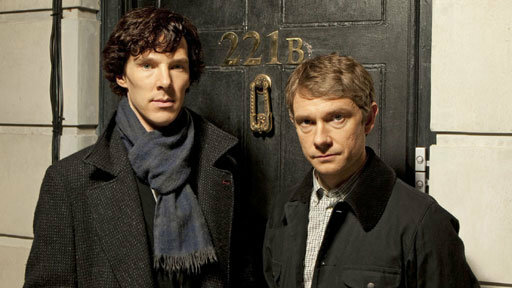 He and Dr. Watson engage in a cat-and-mouse chase through the streets of London until finally the criminal is caught. Holmes uses his immeasurable intellect and knowledge of forensic science to work out the clues, flabbergasting both the police and his friend at every turn. He is a wunderkind, a sociopath with little time for trivialities, women or authority. He is exactly as Arthur Conan Doyle portrayed him. He is not the womanising swashbuckler Robert Downey, Jr. played (even though I did enjoy the movie), nor is he the man who is intolerably rude to Dr. Watson a-la Basil Rathbone. Benedict Cumberbatch (now there’s a name that rolls of the tongue) is a revelation as Holmes. He plays him as a manic genius who doesn’t think twice about running off to follow a hunch without telling a soul. But he displays a quiet respect for Watson, played with masterful understatement by Martin Freeman, knowing all the time that even though he’s not the easiest man to get along with, Holmes needs a foil for this thoughts. Freeman’s Watson is no sidekick; he’s not quite Holmes’ equal, but his intelligence and admiration for his new friend become our eyes and ears into the detective’s world. Mrs Hudson is here, too, as is Holmes’ place of residence: 221b Baker Street. It’s a nice flat; I’d live there myself if I could. Lestrade is around. So is Mycroft, Sherlock’s brother. And so is the spectre of the Napoleon of Crime, Professor Moriarty. We haven’t seen him yet, but he’s there, following Homes’ every move. Where Life on Mars and Ashes to Ashes brought modern policing techniques back in time to the 1970s and ’80s, Sherlock brings a man, very much ahead of his time in the late 19th century, forward in time to the 21st. It shouldn’t work – but it does. See it whenever you get the chance. If there’s any justice in the world you will spend 90 minutes exactly the way I spent mine: grinning like a fool. If that doesn’t float your boat, there’s always Antiques Roadshow. This entry was posted in Television and tagged 221b Baker Street, BBC, Dr. Watson, Mark Gatiss, Sherlock, Sherlock Holmes, Stephen Moffat. Bookmark the permalink. I adore Sherlock Holmes—all of the Sherlock Holmeses. Whoops, I can’t have spelled that right. Oh well, will we be able to get this new mod Holmes here is the U.S.? Sherlock Holmes is timeless . . . no reason that he or Watson needs to stay in the Victorian ages. It’s made by the BBC. So there’s a very good chance that you’ll see it if you have BBC America. I sincerely hope you do. If they can do it with James Bond, there’s absolutely no reason why they can’t with Holmes and Watson. Do I really need to buy a TV and pay the TV tax? NO. I will wait till the box set comes out. (and, then probably never watch it anyway). Am I TV impaired or what? Maybe I will just wait till I can see it at my brother’s in the US. Was there a show called the Sopranos? Was Beverly Sills in it? Have a feeling her acting was shyt. You’re nuts, do you know that?